The months of November and December 2002 really put Grand Prix Audio on the map. Starting with my own review on the 11th hour, Stereophile's Paul Bolin followed suit in December. Then Jim Merod of The StereoTimes barely squeaked past the checkered flags of '03, turning that last corner of the year a mere three days before the fireworks went off. And off they went for one Alvin Lloyd, self-confident maker of said Monaco Modular Isolation System. Had his formidable chutzpah predestined it that way? Was this civilian cluster fun merely the unwitting result of fortuitous timing? After all, to have three feature reviews of the same product hit the press within 60 days is quite the hattrick. Intentional or not. Well, we'll never know - about chance, circumstance or clever conniving. What we do know? That Alvin's elegant Monaco rack, in a variety of contexts, appears to rewrite the rules. 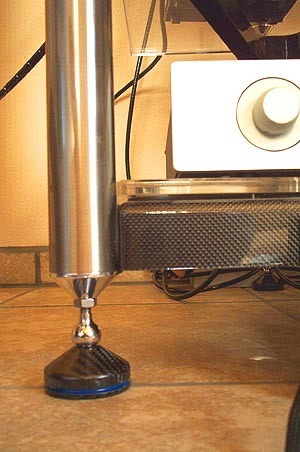 About what -- and how much -- we can and now should expect from equipment stands comprehensively engineered to attenuate vibration while making a truly dapper fashion statement. However, the man from GPA apparently is not one to rest in the pit stop longer than necessary. The competition -- imaginary or real -- might overtake him. Not a prospect any racer finds acceptable. He's now issued an ingenious multi-purpose add-on to stretch out his track record. Dubbed Apex -- as in high point or crest -- it works as both floor-coupling spike replacement and component footer striking a merely superficial resemblance to the new Stillpoints (which are distributed by ex-Aurios priest Paul Wakeen who now works with former Wadia talent instead of the structural engineers at Vistek). Upon closer inspection, the cleverly named Stillpoints are actually based on multiple bearings inside a round pyramidal Delrin body. Those four hidden bearings float a single visible ball that makes contact with the equipment whose weight displaces this ring bearing to the circular edge of the Delrin enclosure. 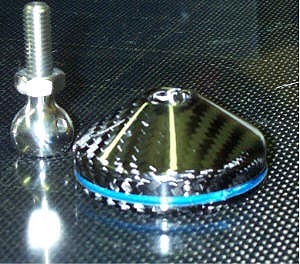 The Apex device is physically larger while similarly shaped but instead uses a triple-layer composite approach: Two hand-laminated, high-pressure vacuum-cured layers of Carbon fiber (the outer skin and core/base) are decoupled via a propietary damping polymer (the visible blue "gap") that was jointly developed with an aerospace applications engineer. This constrained layer structure tops out in a steel ball that nests in a high-rim hollow such that the ball remains securely captured with a minimum of play to banish the frustrating equipment spin/sway/jiggle that plagued both Aurios and Rollerblocks especially with lighter gear and heavy cables. By cupping the ball from above like a socket joint, what remains visible of the bearing once placed inside the Apex hollow is a very thin sliver. There's simply no way even a significant physical bump by a careless visitor or boisterous kid could "jump the track" of a rack thus anchored. An apex'd stand theoretically gains two degrees of front-aft/side-side freedom but the actual amount of displacement prompted by vibrations remains utterly invisible. Grand Prix Audio makes available these knuckle adjusters at different thread-pitch, -count and -diameter to fit equipment stands by other manufacturers. According to its maker, the improvement made under traditional metal tubing stands even when loaded with ballast is rather significant and readily audible. Interestingly, the standardized size of Alvin's hard-chrome steel ball allows owners with large investments in costly Tungsten carbide, silicon nitrite or other expensive hi-tech balls to use 'em in GPA's Apex without purchasing redundant parts. Alvin Lloyd accedes that different ball composition will affect sonics by a subtle margin. Yet his measurement-driven business philosophy is intensely pragmatic. It thus still remains somewhat at odds with promoting a minimal-percentage "zero sum" game, one that inveterate tweakers motivated by popular claims might fret over. Simply put, Lloyd isn't sure he'll be offering different balls. He's happy with his and doesn't see himself as a seller of marbles. He'll leave experimentations to those end users so inclined. Perhaps in the future, his site will sport a source listing for various "High-End high-performance" balls at reasonable rates? For now, he's convinced that the major performance advantage is embedded in the Apex composite materials and how they interface with vibration migration in actual applications. Percentage-wise, it's clearly the far more important and substantial aspect of his design than what the darn balls are fashioned from. This ex-racer in Southern Cal has interesting things to say on the entire subject. Subject? You could call it a level-headed crusade against grandiose statements that lack backup in predictable, repeatable and hence measurable science. The science part points at the mechanical nature of vibration isolation and thus its quantifier: "X" amount of attenuation/reduction of mechanical energy. If a vibration isolation device works as advertised, you can (clearly should be able to - unless it's all hype and hot air) measure the degree of attenuation it affords, in dB or as a percentile function against the input. This private crusade includes disdain for the old high-mass religion of manly rigidity - where equipment supports are concerned. Lloyd concedes that mass does work. But, he's adamant that the amount you'd have to bring to bear is lop-sidedly disproportionate, prohibitive in the real world and thus unreasonable when compared to the actual energy attenuation achieved. He calls this concept outdated and a very primitive, brute-force-for-little-return approach that, in residential use, is far too ineffective to serve as a primary recipe for meaningful success. Visco-elastic damping and multiple degrees of freedom -- when coupled to mass in a tertiary fashion -- are his chosen assault paths. His convincing explanations had me briefly flash on Mel Gibson's Braveheart character. He returns to his village of birth a grown man only to face a boulder hurling match for a welcome. The burly challenger throws farther, a predictable outcome that William Wallace laconally graces with the jibe "can you do that when it matters, in battle?" before volunteering himself for target practice. Naturally, the enraged Scot misses Wallace with a huge rock that would have crushed a man twice his size had it hit. Wallace then picks up a small stone, strikes his opponent squarely between the eys and, to cheerful applause, knocks him cold to the ground. Perhaps the popular notions of 500 lbs solid-steel equipment racks are a bit like boulder hurling - impressive in a barbaric, kilted fashion but apt to miss the real target more often than not? Let's see whether the light-weight yet immaculately clad Apex hits or misses. Before we do, one brief aside: In his recent review of the Silent Running Audio VR 3.0 isoBASE Equipment Platforms, the esteemed Editor of SoundStage! muses that it's "important [to] keep things in perspective. So often I read reviews of equipment stands and racks that would have me think such products are in the signal path and bringing forth the sound themselves". The fact is, anything that alters the sound is in the signal path. How else could it possibly alter the sound? What Marc Mickelson referred to was the electrical signal path. Obviously, purely mechanical devices added onto an audio system don't "plug into" or directly become part of its electrical transmission. However - mechanical resonances affect, overlay, modulate and thus interact with the signal's electron fields as well as its conversion into mechanical sound pressure waves. Thus for all that matters -- for what's clearly audible -- such devices (including outboard power supplies) are in the signal path. As is your room and everything in it - those unsightly untrimmed hairs in your otherwise cherished and cute ears, for example? Yes, perspective is terribly important here in this realm of potential hyperbole where quack salemanship and wishful thinking are king. So unless you've personally tried the Grand Prix Audio Monaco device, you will find reviews such as my own of two months ago unbelievable. As a reviewer faced with such a paradigm scenario, you could well opt to under-write your findings lest your credibility be found waning. Which, in fact, seems to be the next perception hurdle in their blanket "accessory" market that encompassing engineering solutions such as ALvin Lloyd's have to overcome. Not that they work or make a difference - that's been established. But how much of a difference they make. Plainly, they -- the truly formidable ones -- have to be taken far more seriously than to find themselves delegated to mere tweak status, in the grab bin of cable lifters and magic markers for the more crazed, experimental or truly dedicated of audiophiles.